Today, a terrifying video was spreaded online in which the I-70 highway collision can be seen from the United States. The video was captured by a truck driver, who also found himself in a car accident in bad driving conditions. The reason for collision was very poor visibility, cold weather and snow on the road. In a video uploaded by Jameon Weaver to the web, we can see scenes of collisions near Oak Grove on the I-70 highway and a lot of drama. According to the latest data, 47 vehicles were involved in the traffic accident and 50 passengers were injured. For one of the passengers, the collision was fatal. Many people have found themselves in trouble on the roads throughout the United States, as many cities have again been covered by snow and cold weather. 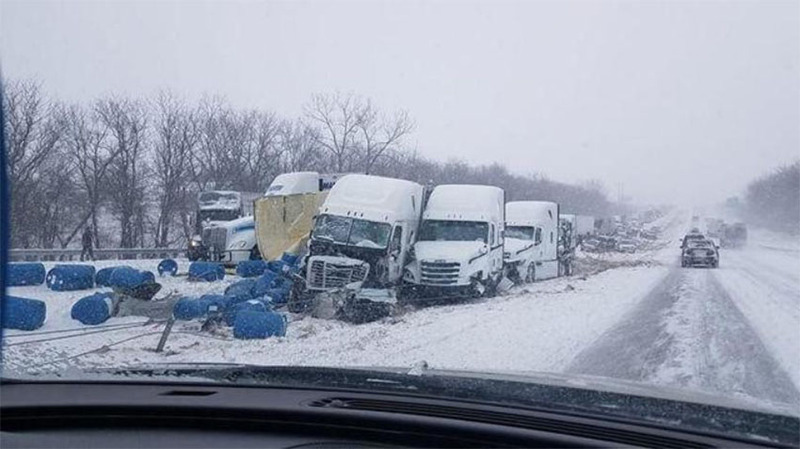 Drivers in the vicinity of Oak Grove on the I-70 highway also witnessed such conditions. Before viewing the video, we warn you that the scenes are horrible, so watching video is at your own risk.